This is a short story, and it's kind of boring. 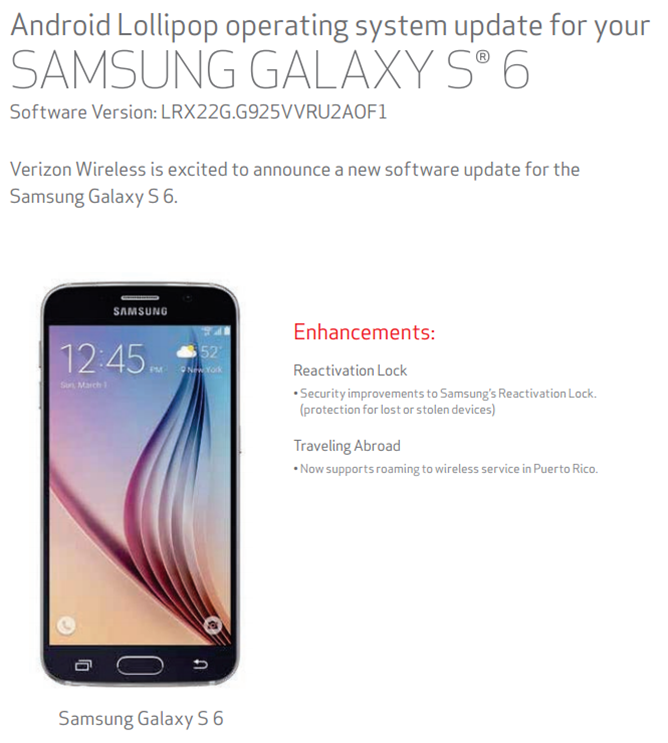 Pretty much everything is up there in the title, in fact: the Verizon-specific versions of the Galaxy S6 and Galaxy S6 Edge are both receiving updates, at least according to Verizon's support websites. They enhance the Reactivation Lock anti-theft feature in Samsung's software build, which needed tweaking for some reason, and allow Verizon roaming when visiting Puerto Rico. That's it. No 5.1 bump, no extra features. That's all there is, there isn't any more. I could take this opportunity to pat Android Police on the back, and mention the fact that we always strive to give our readers clear and useful headlines. I could say that we're proud that we've never been featured on something like @SavedYouAClick (keep up the good work, Mr. Beckman). But instead, I'll remind you that all post-Lollipop Android builds will refuse to flash over-the-air updates if you make any modifications to the software, and that carrier rollouts mean it could be up to a week or more before you see the update notification.